Note: I received this book from the publishers via NetGalley in exchange for a fair and honest review. Greg is trying to survive high school, and is doing rather well at it. He's got a wonderful tactic of just avoiding pretty much everyone - never getting close to any group of people, never alienating any group either, just coasting along on nodding terms with everyone. The exception is Earl, who he makes low-budget version of cult classic films with. His life is about to be changed, though, as his mother is determined that he should rekindle an old friendship with Rachel Kushner – who’s dying of leukemia. Despite Greg’s protestations to the contrary in the early part of the narrative, at heart, this is a weepie. We find out early on that Rachel dies – but it’s easy to forget that as we’re caught up in the hilarity that ensues as Greg tries to juggle a friendship he’s being forced into, his movie-making, and his efforts to survive at school. Given the topic, it’s perhaps surprising that so much of it is deeply funny, but there’s no questioning the amount of laughs it provided me with. As well, Greg and Rachel are pleasant characters to spend some time with. The undoubted star, though, is Earl – Greg’s vertically challenged co-director of a host of films, violent, foul-mouthed, and likely to windmill-kick you in the head if you criticise him, but still showing more sense and empathy than our narrator can manage for most of the book. As we progress, though, Greg starts to grow up a bit and becomes a character really worth rooting for. Oh, one more thing - the dialogue is amazing. 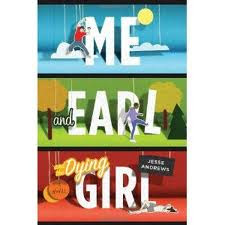 Every conversation, especially those between Greg and Earl, is note-perfect and a joy to read as well as being really realistic. It’s also a really easy read – despite the subject – with short chapters which include ‘script’ type conversations and Greg’s lists as well as the traditional narrative part. Strong recommendation for this one, as it pulls off the difficult task of being funny and moving really well. I’m keen to read Andrews’ next book already!